The Center for Next Generation of Materials Design (CNGMD) is an Energy Frontier Research Center (EFRC) of the U.S. Department of Energy Office of Science. The CNGMD couples first-principles theory with state-of-the-art synthesis and characterization to understand and predict structure, properties, and phenomena at the molecular, nano, and meso scales. 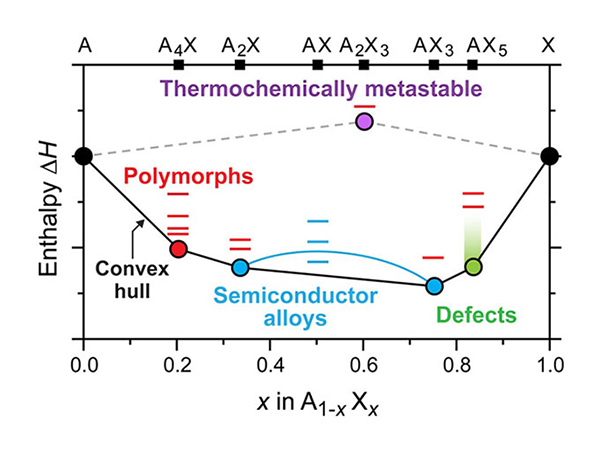 Further, the center is specifically designed to overcome four critical scientific "gaps"—multiple-property design, accuracy and relevance, metastability, and synthesizability—to make computational materials design a robust tool delivering new functional materials. Our initial materials focus has been semiconductors for solar energy conversion, solid-state lighting, and related technologies. CNGMD researchers are studying four types of metastability above the convex hull of ground-state structures. The Center for Next Generation of Materials Design consists of scientists from seven institutions: the National Renewable Energy Laboratory (NREL), the Colorado School of Mines, Harvard University, Lawrence Berkeley National Laboratory, Massachusetts Institute of Technology, Oregon State University, and SLAC National Accelerator Laboratory. Dr. William Tumas (NREL) is the Center Director.